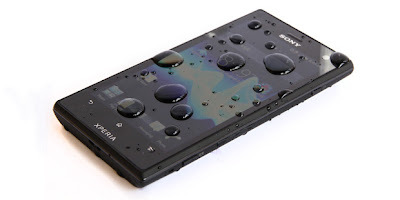 While virtually sealed, water can easily seep into the phone in a very short time. The difference a few seconds can determine life or death for your gadget. Therefore, remove the phone from the water as soon as possible, and then indirectly turn off to prevent short circuit (short-circuit). Do not turn down before being dried. The reason, perhaps still burning and electricity can flow into the water in the vicinity of the phone. His intention to save the phone, rather than the soul itself could be threatened. Turn off the power first, then ask for professional help. If the phone fell into the water when not connected to a power outlet, please read the next step. This is one of the most important steps. Most of the electronic components inside the phone can survive even if exposed to water, as long as there is no power from the battery. To check for water damage, check corners surrounding the battery in an area that is a circle or a small white box, with or without the red line. If the color is not white but changed to pink or red, it means that there is damage from water seepage. Read the manual quickly if do not know how to remove the battery. The data and information stored on the SIM or memory card is sometimes more important than the phone itself. Therefore, although these compounds are relatively water resistant, you should immediately remove it to prevent things that are not desirable, such as corrosion of the contact parts are made of metal. Then, immediately drain the SIM and memory card, do not put the phone before it is completely dry. Accessories can trap water so that complicates the process of drying. Immediately off everything after the phone out of water. This time, try to be more thorough than the first attempt. Drain as much water from the outside and the phone (battery compartment) by wiping gently using a towel. Do not move their phone to move the water in it was not thither. Strive to position the phone does not change while drying. Note the towel so not to get caught in between the surface of the phone. Cleaning the inside of the phones with alcohol can help remove water. To drain the water out of the phone, use a vacuum cleaner when there. Turn and point to each part of the wet for about 20 minutes. To avoid pain, Take turns holding it with others. This method can quickly drain the phone so it can be turned on in the shortest possible time, just half an hour when the phone briefly dipped into the water. Do not direct the funnel vacuum cleaner too close to the phone because it produces static electricity, which is even more dangerous for phones than water though. Do not use a hair dryer (hair dryer) or any objects that are winds to dry the phone, although it is set to "cool". Such tools can push more water and moisture deep into the phone so that potentially exacerbate the damage. Examples are widely available is rice. Enter your cell phone into the rice and leave overnight or longer. Materials that are more effective moisture absorbent silica gel or another. Enter the phone with silica gel in a sealed container. To be effective, turn the phone's position every few hours so that water trapped inside to flow out through the bottom. 9. Remove the phone, then put it on a towel, handkerchief or other cloth. If it turns out there is still moisture in the towel or handkerchief, repeat the drying with a vacuum cleaner and the next steps. Once the maximum effort and wait for at least 24 hours, it's time to try to turn on the phone. First check every part of the phone to ensure that the device is completely dry. Then, insert the battery into the posnel, turn on, and see if the phone is functioning normally. If the phone is completely dry but it just would not start, try to connect it to the charger. If the phone can be lit this way, the battery is probably defective and should be replaced. Do not attempt to disassemble the phone itself without professional help. You are potentially exposed to hazardous chemicals from a cell phone or electric shock. If the phone is turned on but not functioning normally, there may have been corrosion due to water that remains. Remove all batteries and accessories, and then try again and wipe dry-contact metal box. You have finished reading Tips to Save a Mobile Phone Submerged Water and many articles about Tech Gallery in our blog this, please read it. and url link of this article is https://littlebitjohnny.blogspot.com/2013/02/tips-to-save-mobile-phone-submerged.html Hopefully discussion articles on provide more knowledge about the world of new tech gadgets.